February sees the launch of a major project to restore Thoor Ballylee and create a world class culture and education centre in time for the 150th anniversary of the birth of W.B.Yeats in June, and the Yeats2015 worldwide programme of cultural events. 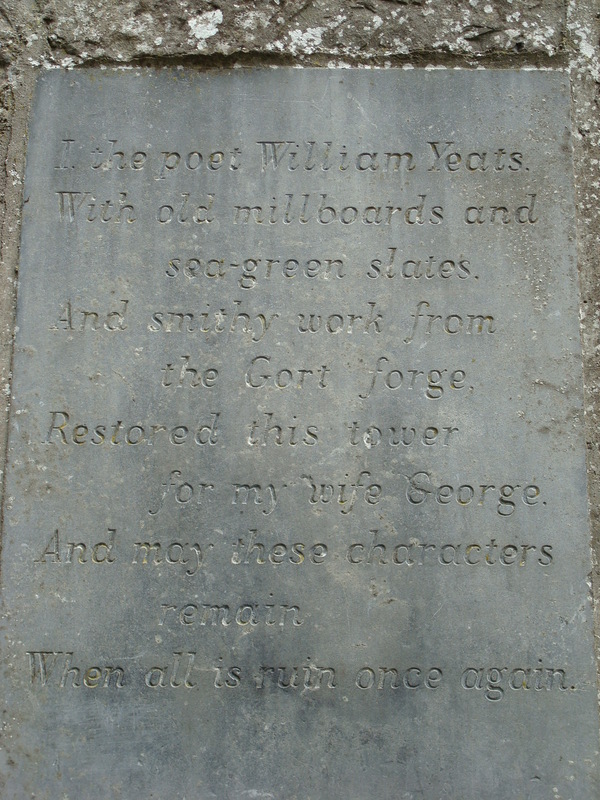 The Yeats Thoor Ballylee Society will launch the project on Friday February 6 in the Lady Gregory Hotel, Gort, at 8pm. A fundraising objective of €1 million has been set for the project. Senator Fidelma Healy-Eames, the chair of the Yeats Thoor Ballylee Society believes the proposed centre could become “a huge attraction for the area”, in turn boosting tourism revenues for the south Galway region. The Minister of State for Tourism Michael Ring granted a licence which allows the group to start fundraising to secure the money needed to re-open the tower and the committee is actively promoting the project among local, national, and international business and philanthropic bodies to achieve the €1 million needed. Senator Healy-Eames said the funds will be used to develop and market the centre and meet essential capital and running costs. The tower will accommodate a new exhibition, a café, bookshop, and space for exhibitions, lectures, and classes. The surrounding gardens and trail to the old mill will also be developed. 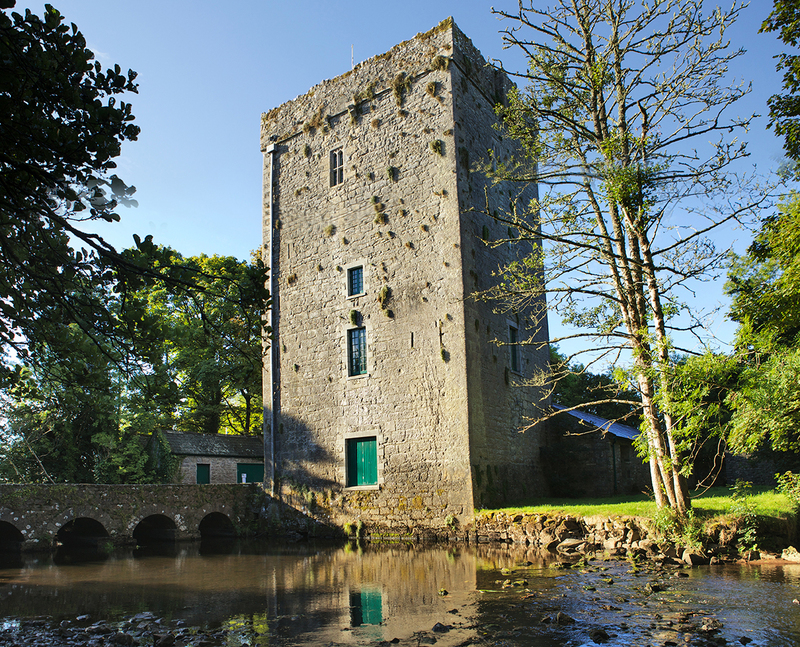 The fourteenth-century Norman tower is intimately associated with W.B.Yeats who owned and lived in the tower with his family between 1921 and 1929. It was also during this period that he was awarded the Nobel Prize for Literature. Read about this story in the Galway Advertiser. One of the highlights of the Yeats2015 programme will be an extra special summer school. The 56th Annual Yeats International Summer School is set to run from 26th July to 7th August, 2015, in Sligo, Ireland. With patron Catriona Yeats, director Meg Harper (University of Limerick), and associate director Matthew Campbell (University of York), the annual festivities in Sligo will celebrate the poet’s sesquicentennial in style. A roundtable of former Summer School directors, including Helen Vendler, Denis Donoghue, James Pethica, and Elizabeth Butler Cullingford, will be foremost in this summer’s special events. The line-up of speakers is equally impressive and it includes David Lloyd, John Paul Riquelme, Vincent Sherry, Joseph Valente, Catherine Paul, Frank Shovlin, Frank Lentricchia, Denis Donoghue, Eamonn Hughes, Marjorie Howes, Hannah Sullivan, Warwick Gould, Ann Fogarty, and Alexandra Poulain. Attending the summer school is a rewarding experience involving morning lectures, afternoon seminars, and enriching cultural events in the evenings. 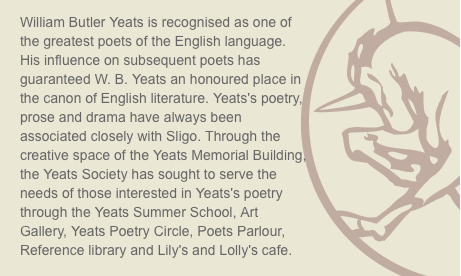 For more information, see the website of the hosts, Yeats Society Sligo.